Uskowi on Iran - اسکویی در باره ایران: Rouhani Wins! 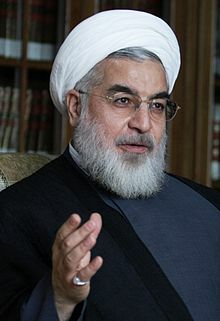 UPDATE: Hassan Rouhani won the presidential race with 51% of the votes. Out of 36,704,156 votes cast, Rouhani received 18,613,329. As most knowledgeable Iranians had predicted, this is a great testament to the hybrid Iranian Islamic democracy to have such fair, peaceful and mass turnout polls. It is expected that this election's turnout will exceed all previous ones. Due to such a huge turnout polling hours were extended in most cities, particularly Tehran. This great election is a huge slap in the face of Iran's pathetic enemies and out of touch self-hating exile freaks. There were also huge crowds of voters in over 100 foreign cities and polling stations. Iranian democracy and people's participation in such large numbers vindicates the Islamic Republic once again. The revolution was indeed Iran's greatest achievement in history.IRAN PAYENDEBAD. Darood bar Rahbar. Very pleasant experience voting this morning in northern California. lets not jump to any conclusions. so it could still change a lot , hang in there Ghalibaf ! It is indeed a slap in the face of your beloved "Rahbar" that Rafsanjanis and Khatamis candidate Rohani most likely will win the "selection". It shows that even with minimal choice and freedom, the Iranians desperate for change will choose the least worst of the candidates. Payande Bad US and Europe for the sanctions and putting the necessary pressure on these Mullahs. There is saying in Persian: "Mardomo be marg migiran, ke be tabb razi beshan"
Even if "selected" Rohani will not have a chance for any real change of this barbaric regime. This shows the power of the sanctions and international pressure on the Mullahs and their cronies. They had to let someone like Rohani to participate to get a high turnout. It also shows the desperation of Iranians for some change, even in the form of another well spoken Mullah. This regime reminds me of the mad hatters tea party in Alice in Wonderland.